一開始大部分的人對於 SAS 速度有誤解,一般我們在討論 SAS 2.0 的速度是 6Gbs,但你可以看到 SAS HBA 或是 SAS JBOD,EBOD 的連接埠通常是 mini-SAS 或是 QSFP 的裝置,這些連接埠的速度都遠大於 6Gbs,為什麼呢!!! 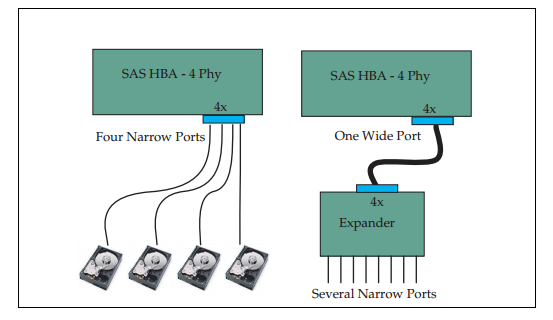 這是因為 SAS 的特別之處 “wide port”，一個 SAS port(4 Phy) 可以提供 4 條 narrow links (彼此都是獨立的),所以一個 SAS port(4 Phy) 可以提供 6Gbps (SAS 2.0) x4= 24Gbps =3GB/s x80% (8b/10b 編碼 20% 的 overhead) = 2.4GB/s , 通常 narrow links 是直接連接裝置,但我們也可以透過 One wide port 與 Expander 的骨幹頻寬連接方式. Serial Attached SCSI (SAS) 使用 point-to-point serial protocol 點對點的協定做主機板與儲存裝置之間的資料做傳送,SAS 取代了之前的 Parallel SCSI (Small Computer System Interface :SCSI),協定, 指令集還是採取 SCSI command set,跟 SCSI 不同的是使用了序列 serial 方式做為傳送方式. 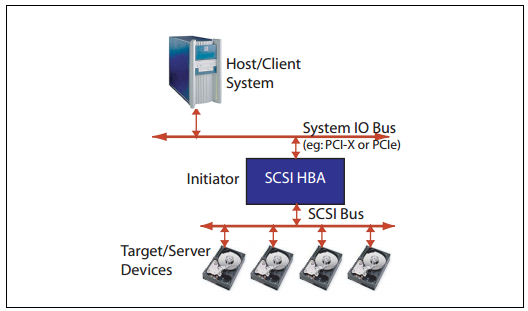 Initiators 通常指提供主機板上的 SAS 連接埠或是一張外接 HBA (host bus adapter). Initiator / Target 在 wiki 上面定義或許對於非專業人士(我)看不是很懂,尤其關於 device-service 以及 task-management 的關係,大概可以把這兩者關係想成需求端 (Initiator) 和提供端 (Target) 的關係. 通常連接 initiator 與 target 兩端時沒有 expanders(後面有解釋) 或是 backplanes(背板) 的時候是指連接 initiator 與 target 兩端的線材. 因為 SAS 的特性,可以在單一的 initiator 埠,連接多個 SAS End device 靠的就是 Expanders 的幫忙. 序列 SCSI協定 Serial SCSI Protocol (SSP) — 支援 SAS disk drives. SCSI 通道協定 Serial ATA Tunneling Protocol (STP) — 支援 SATA disks. SCSI 管理協定 Serial Management Protocol (SMP) — 管理 SAS Expanders. 在 SAS 裡面有一個是很重要的就是 Serial Attached SCSI Expanders (SAS Expanders) ,它可以讓 SAS 同時與多個 SAS devices 做溝通. Expanders 包含 2 個或是多個外部 expander-ports. 每一個 expander 裝置包含至少一個 SAS Management Protocol target port 做管理. Expander 如同網路架構下的網路 switch 裝置,透過 switch (Expander) 可以讓多個系統同時連接. 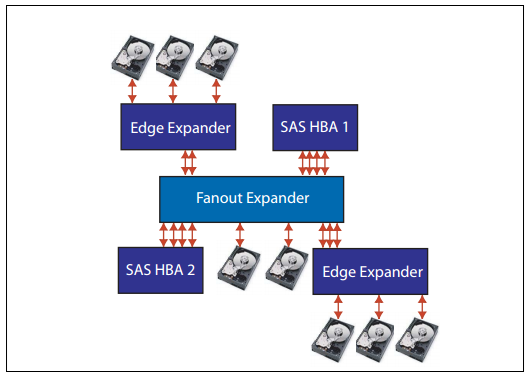 允許的裝置定址上限是 255 SAS addresses, 可以讓 SAS initiator 連接額外的裝置,但 edge expander 的使用上限是 2 個,如果還需要更多的裝置時,則需要使用 Fanout expanders 來解決這個上限問題. 連接上限是 255 個 edge expanders, 就可以讓更多的 SAS 裝置可已被定址.